Abstract. 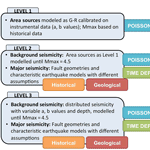 This paper describes the model implementation and presents results of a probabilistic seismic hazard assessment (PSHA) for the Mt. Etna volcanic region in Sicily, Italy, considering local volcano-tectonic earthquakes. Working in a volcanic region presents new challenges not typically faced in standard PSHA, which are broadly due to the nature of the local volcano-tectonic earthquakes, the cone shape of the volcano and the attenuation properties of seismic waves in the volcanic region. These have been accounted for through the development of a seismic source model that integrates data from different disciplines (historical and instrumental earthquake datasets, tectonic data, etc. ; presented in Part 1, by Azzaro et al., 2017) and through the development and software implementation of original tools for the computation, such as a new ground-motion prediction equation and magnitude–scaling relationship specifically derived for this volcanic area, and the capability to account for the surficial topography in the hazard calculation, which influences source-to-site distances. Hazard calculations have been carried out after updating the most recent releases of two widely used PSHA software packages (CRISIS, as in Ordaz et al., 2013; the OpenQuake engine, as in Pagani et al., 2014). Results are computed for short- to mid-term exposure times (10% probability of exceedance in 5 and 30 years, Poisson and time dependent) and spectral amplitudes of engineering interest. A preliminary exploration of the impact of site-specific response is also presented for the densely inhabited Etna's eastern flank, and the change in expected ground motion is finally commented on. These results do not account for M > 6 regional seismogenic sources which control the hazard at long return periods. 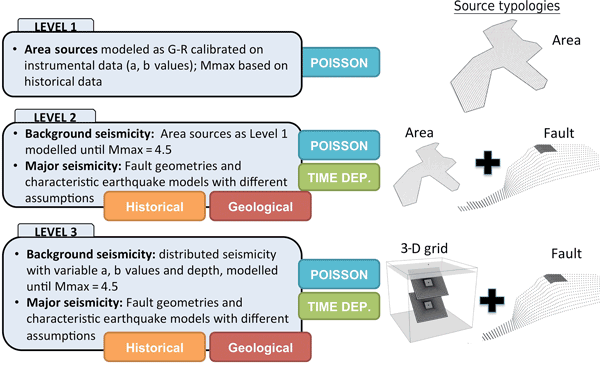 However, by focusing on the impact of M < 6 local volcano-tectonic earthquakes, which dominate the hazard at the short- to mid-term exposure times considered in this study, we present a different viewpoint that, in our opinion, is relevant for retrofitting the existing buildings and for driving impending interventions of risk reduction. How to cite: Peruzza, L., Azzaro, R., Gee, R., D'Amico, S., Langer, H., Lombardo, G., Pace, B., Pagani, M., Panzera, F., Ordaz, M., Suarez, M. L., and Tusa, G.: When probabilistic seismic hazard climbs volcanoes: the Mt. Etna case, Italy – Part 2: Computational implementation and first results, Nat. Hazards Earth Syst. Sci., 17, 1999-2015, https://doi.org/10.5194/nhess-17-1999-2017, 2017.